Happy birthday, Dr. Seuss! Theodor Seuss Geisel was born on March 2, 1904. He died in 1991, leaving behind some of the most well known stories for young readers. But his books are more than just fun adventures for children – everyone can learn something. Here are six smart rules for success from Dr. Seuss. In 1954, first graders were learning to read with boring books that featured perfectly groomed, freakishly courteous children who spoke like robots. 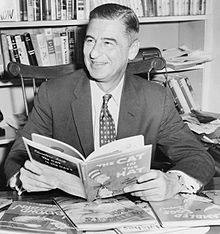 William Ellsworth Spaulding, the director of Houghton Mifflin’s education division, challenged Dr. Seuss to write a book for six-year-olds that introduced normal characters who did something fun and interesting. But the book had to be one that early readers could tackle, so he made a list of 348 words that first-graders could read and asked Seuss to include no more than 225 of them. The Cat in the Hat (1) forever changed the way first-graders learned to read. It featured an audacious, reckless, humorous cat who shows up to rescue two children from boredom on a rainy day.